As you may have already noticed, I’m kind of in love with pizza. Pizza was a memorable dish I grew up eating at my grandmother’s house during the summers, and I am a firm believer that one of the greatest characteristics of Southern comfort food is familiarity. Pizza has remained to be one of my most beloved and treasured meals. Here are a few tips I have found helpful throughout my dough-making days, and I hope they encourage you to make your own! Pizza stones and paddles are completely fine to use when making pizza, but they are not necessary. I’ve used heavy duty rimmed baking sheets to make pizzas, and the crust still gets crunchy and charred (no preheating required for the baking sheet.) But if you do have a pizza stone, which I do and love, preheat the stone in a 500-degree oven for at least 45 minutes. Lay your dough onto a piece of foil or parchment paper, roll it out to your desired thickness and top it with the ingredients. Once the oven is preheated and the stone is hot, slide the pizza (parchment paper/foil and all) into the oven onto the stone. After 10-15 minutes, just slide it out of the oven and onto a cookie sheet for easy transport back to the counter. Dough is sometimes temperamental when rising. So, to make sure I get consistent results, I preheat the oven to 200 degrees for 10 minutes, turn off the oven and let the dough rise, covered with a tea towel for 1 hour in the oven. This way, no matter if its chilly or scorching outside, my dough will always rise, worry-free. Yes, you can freeze pizza dough. I usually make pizza dough one day a week and save it for quick dinners and lunches for the rest of the week. Whenever the dough has finished rising, cut the dough into 8 equal pieces (each piece is 1 serving), wrap each piece in cling wrap and stack the covered pieces of dough into a gallon-sized Ziploc bag. The dough will stay good for 3 months. When ready to use just take out however many individual balls of dough that you may need and let them come to room temperature for 2-3 hours on the counter. For all you visual learners, below is a collage of photos on how to make the basic pizza dough using a Kitchen Aid fitted with a dough hook attachment, but the full recipe for both this method and making dough by hand are also listed below. Add 2 packages of yeast and 2 tablespoons of sugar to 2 cups of warm water and stir to dissolve the yeast. Allow 5-10 minutes for the yeast to bloom and become foamy. Add 2 tablespoons of salt and 4 tablespoons of olive oil to yeast mixture. On low speed, add 3 cups of flour until slightly combined. Add the other 3 cups of flour and continue mixing on low speed. The dough will begin to come together after about 1 minute or so. Keep an eye on the dough as it begins to pull away from the bowl. Once the dough wraps itself around the dough hook, it’s time to transfer the dough. Place the dough in a large, oiled bowl and let rise in a warm place for 1 hour. Once the dough has risen for 1 hour, it will have doubled in size. Punch, literally, punch down the dough. Get in there! Form the dough into a ball and place on a lightly floured surface. Then, cut in half and those halves in half, creating 8 equal pieces of dough. Form each piece of dough into a ball. If freezing for later use, wrap each ball of dough in plastic wrap. Place all pieces of wrapped dough in a gallon-sized Ziploc freezer bag. Dough will keep good in freezer for up to 3 months, so label! If using immediately, place 1 piece of dough on a piece of lightly floured parchment/ foil. Roll out dough to desired thickness, and the dough is now ready for toppings! Enjoy! Note: If you aren’t one for breaking out the thermometer to check the water temperature for the dough, just put the very tip of your finger in the warm water, if it begins to burn after a few seconds, it’s too hot, but if it’s not warm to the touch, it’s not quite warm enough. You want to make sure you start off with the correct water temperature, or else the yeast will not bloom, and you will have to start over. No bueno. Increase to medium speed and mix the dough until it begins to form a ball and wrap itself around the hook, this step should take about 2 minutes. With your thumb and index finger, squeeze the dough. If it’s too crumbly, add more warm water, and if it’s too wet, add more flour, 1 tablespoon at a time. Make sure the dough is smooth and elastic. If making the dough by hand: Combine water, yeast and sugar in a large bowl. Gently stir to dissolve yeast. Let the yeast sit for 5-10 minutes (once the top of the mixture begins to get foamy from one side of the bowl to the other, I know it’s done.) With a wooden spoon, stir in olive oil and salt. Then, begin stirring in the flour. Once the dough is too stiff to stir with a spoon, knead the rest of the flour into the dough by hand. As you knead, squeeze the dough between your thumb and index finger. If the dough is too crumbly, add more warm water, and if it’s too wet, add more flour, 1 tablespoon at a time. Knead the dough until it’s smooth and elastic, this should take about 10 minutes. For both methods: Form the dough into a ball and place into a large bowl coated with olive oil. 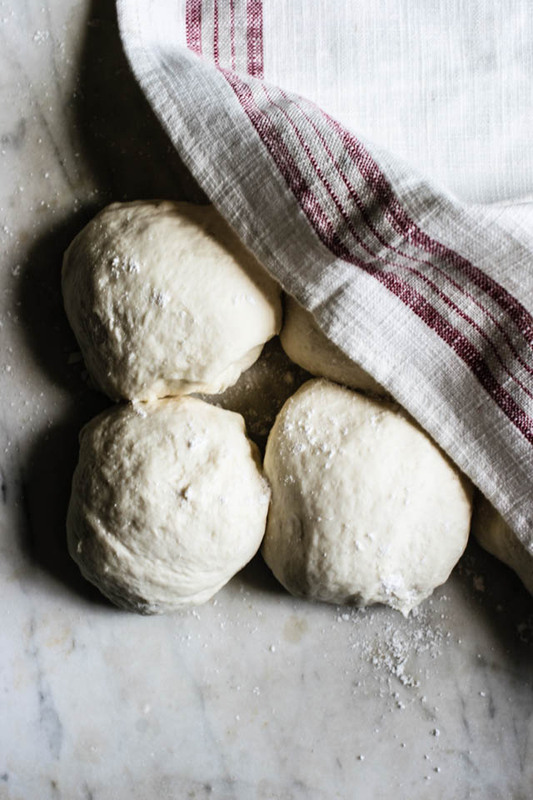 Cover the dough with a tea towel to discourage a skin forming on the dough. Place in an oven that has been preheated to 200 degrees and shut the oven off. Let the dough rise for 1 hour in the warm oven. Once the dough has risen, punch down and cut into 8 equal-sized pieces (or cut the dough in half for 2 large pizzas, which serves 6-8 people total.) Use the dough immediately or freeze up to 3 months. Gotta love pizza! And good dough really makes it. This sounds lovely! I love the details and visuals you have provided. This actually makes it look easy…and I already know it is delicious! It’s way easier than people think. Thanks so much! A far cry from my college days of Chef Boy Ar Dee pizza kits in a box! This is so helpful for those who have never done it from scratch. Thanks for a very easy post to walk through! My pleasure! It’s simple, but I know that many people haven’t actually seen dough being made. So I was hoping that the step-by-step instructions help take the guess work out of dough! Thank you (in particular) for the information on freezing dough – I was so hesitant to experiment with it, but love to have ready-to-use dough. Great post, thank you! You’re welcome! I always have dough stocked in my freezer. Rarely do I make pizzas the same day that I make the dough! Thanks!